Before I give an ode to a particular kind of print (gingham! ), let me give a recap on how my summer went and why I’m legit back to blogging. Beware of a relatively lengthy post. 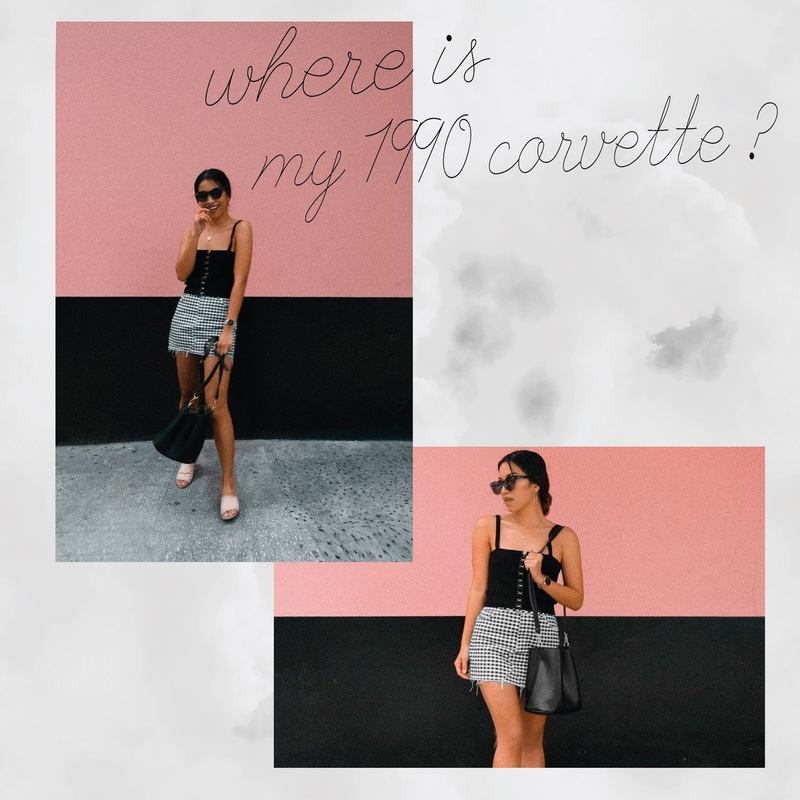 Since I launched this blog, I’ve been constantly torn between keeping my privacy and also being more open to every one of you who have been supporting my blog since day one. However, for the past few months, I have been fist-pumping for what has been an amazing 2017 for me - professionally and personally and I just want to share my successes because you have and always played a part in all of those huge and tiny successes. Also, I have been meaning to post travel diaries on The Style Diplomat but I never had enough time to sit down and create relevant content — up until now. So if you want to know what Liz Dumdum has been doing since 2017 kicked off, then read on. As with any journey, they say who you travel with can be more important than your destination. Literally speaking, I am so glad I got to visit a couple of destinations in Asia and North America with the people who mean the world to me. ☆ Supreme Court Senior Associate Justice Antonio Caprio’s e-book entitled ‘The South China Sea Dispute: Philippine Sovereign Rights and Jurisdiction in the West Philippine Sea’ was finally published and my heart is so full knowing that I helped him with it. ☆ I was able to meet Mr. Paul Reichler, the man who defended David against the World Goliaths and the Philippines’ lawyer again China. As a Filipino, I am forever grateful for all the work he has done for my country. ☆I know how to cook noodles now! Biggest accomplishment, I must say. Well, it has been quite a ride and moving forward, if you ask me, I, for one, am ready for a lot more adventure and a lot less nothing. Essentially, there are a bunch of new and invigorating things going on in my life for which I’m so happy about. A new stage in my life is about to begin and I’m really thrilled for whatever is bound to cross my path in the near future. If you have any questions or you need travel recommendations, just leave a message here. Now, let's get settled. While it's probably true that you can't buy je ne sais quoi in your favorite online store, you can always start wearing gingham and it's almost the same. It's a classic print and with its playful nature and seasonally appropriate allure, I love it in all forms — tops, skirts, shoes, and dresses. Just avoid boys who tell you gingham reminds them of their grandmother's tablecloth. You don't need that kind of negativity in your life. So for my outfit, my adorable gingham skirt is complemented with yet another of-the-moment top: a plush brushed rib knit with metal clasps down the front — a minimal and futuristic look I honestly cannot resist. To sweeten the whole ensemble even further, I paired it with my favorite black sling bag! 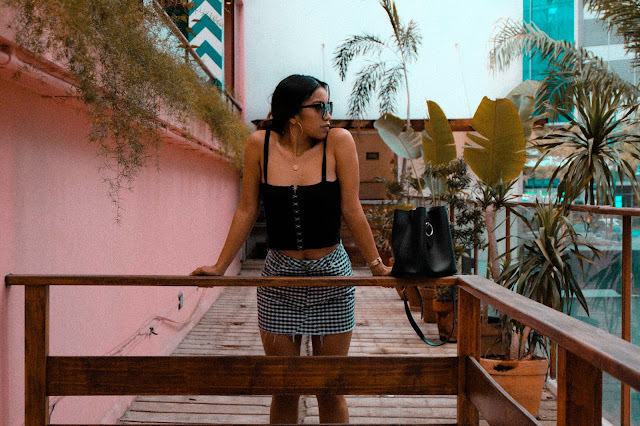 Styled with a glossy black sunglasses and strappy block-heel sandals, the simple look is cool yet unfussy — two things I love in an effortless post-summer outfit in the tropics. Shot while drinking sangria, mid-afternoon, and mid-July in and around BGC.